In some corners of the earth, especially in the poorest countries, children and adolescents are the victims of a terrible form of violence: they are enlisted to fight in the so-called “forgotten wars.” Indeed, they suffer a doubly scandalous aggression: they are made victims of war, and at the same time forced to play the lead in it, swept away in the hatred of adults. Stripped of everything, they see their future threatened by a nightmare difficult to dispel. Our youngest “brothers and sisters” who suffer from hunger, war and diseases are launching an anguished appeal to the adult world. May their cry of pain not go unheard! UNICEF estimates that yearly more than 300,000 children (under the age of 18) are suffering from involvement in armed conflicts around the world (see US State Department’s Fact Sheet). Such sufferings violate the dignity of these children. Many of these children endure human trafficking, labor exploitation, military recruitment, and forced combatants (see the UN’s Six Grave Violations). Some of the worse violators include the Central African Republic, Rwanda, Somalia, South Sudan, Syria, and Yemen. 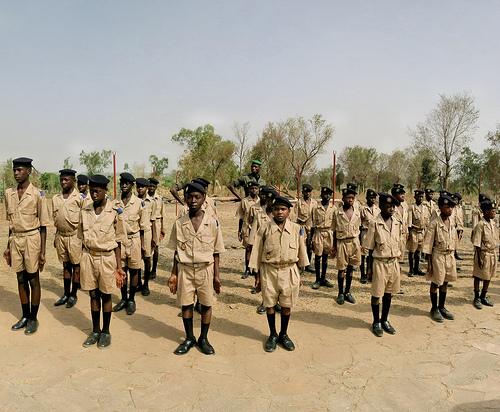 In 2007, more than 50 countries approved “The Paris Commitments,” to end the use of child soldiers. The US Federal Government actively works to address the needs of children in armed conflict. Various bureaus and agencies (such as USAID) within different departments, like State Department, work on reporting and preventing violations of human rights. In 2008 Congress passed the Child Soldier Prevention Act, which restricts funding and assistance to those governments known for human trafficking and child soldier recruitment. Children living in countries where wars are taking place need to be protected. The children need to be healed and comforted, then returned to normal society. Some of the countries do not have enough money to help the children on their own. Various organizations and groups within the Catholic Church work to protect children and help them recover. Catholic missions have special recovery homes for children who were forced to fight or who were harmed by war. With the help of Catholic Relief Services, the Little Sisters of Mary Immaculate have helped rehabilitate former child soldiers in Uganda (see the Baltimore Archdiocese’s Catholic Review’s article). How much am I aware of the rights of others? Rights I myself have? How do I fulfill my responsibilities related to these rights?